Key institutional shareholders use CEO pay for performance as a critical consideration in determining how to vote on Say on Pay, especially as a CEO’s tenure grows and company returns increasingly reflect the incumbent’s strategies and performance. 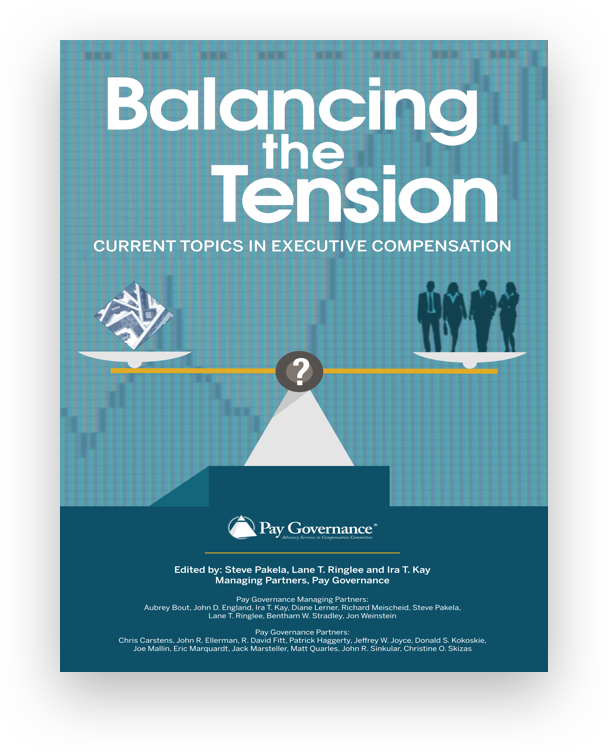 Shareholders’ preference for long-term alignment of CEO realizable pay with company performance suggests use of a long-term strategy for managing CEO total compensation. One such long-term strategy replaces the traditional approach of frequent if not annual increases in base salary, target bonus and long-term incentives with a gradual re-mix of target total compensation toward performance-based long-term incentives over the course of a CEO’s tenure. The career pay strategy caps target cash compensation (base salary plus target annual incentives) the first time it meets or exceeds market median and, as market median target total compensation increases over time, delivers all subsequent pay increases in the form of performance-based long-term incentives. Thus, the pay mix shifts toward long-term pay for performance over the course of a CEO’s career. The career pay strategy taps into companies’ most common competitive pay standard – market 50th percentile. Though targeting market median, most companies do not in practice limit CEO target cash compensation to peer group median. Under career pay, however, target cash compensation is capped for the duration of a CEO’s career once it first meets or exceeds market median. Of course, actual cash compensation received will continue to depend on performance under the annual bonus plan. If target cash compensation at hire or promotion to CEO is below market median, career pay supports subsequent increases in base salary and target bonus up to market median for target cash compensation. Once attaining market median for the first time, however, all subsequent increases in target total compensation for that CEO would be delivered through performance-based long-term incentives. This treatment for future increases also applies to a new CEO with target cash compensation at or above market median. Under the CEO career pay strategy, increases would be made primarily through grants of performance equity, which rules out time-vested restricted stock but includes performance-vested restricted stock, performance shares, performance options, and long-term cash incentives. Time-vested stock options can also be used, but may not be appropriate if they already represent half or more of the grant value of long-term incentives. The average tenure of a departing CEO in 2012 was eight years according to The Conference Board. 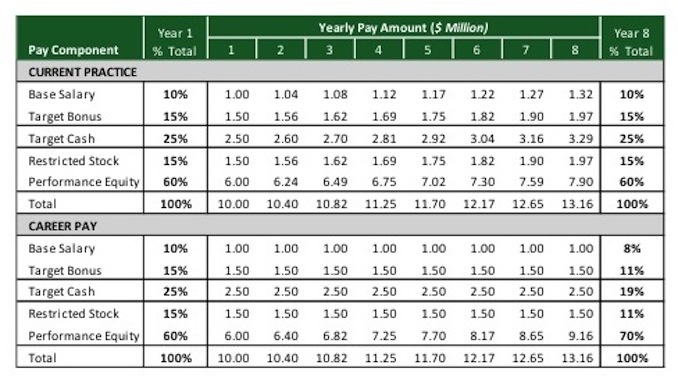 The following table compares typical practice and career pay over an eight-year career. The illustration assumes that CEO target cash compensation is at market median in year 1 ($1 million base salary and 150% target bonus) and that market median target total compensation increases at a rate of 4% per year. Over the CEO’s eight-year tenure, the grant value of performance equity grows from $6.0 million to $9.16 million under career pay, an increase of over 50%. As a result, performance equity increases from 60% to 70% of target total compensation. Clearly, shareholders would prefer increases in CEO compensation to be directly tied to future shareholder returns and not built into base salary, which is not tax-deductible above $1 million, or an increased bonus opportunity that provides a larger bonus than in prior years for achieving annual performance goals. ‍Increases long-term rewards for the CEO to make the investments necessary to build long-term value, reducing the often myopic emphasis on quarterly earnings reports. 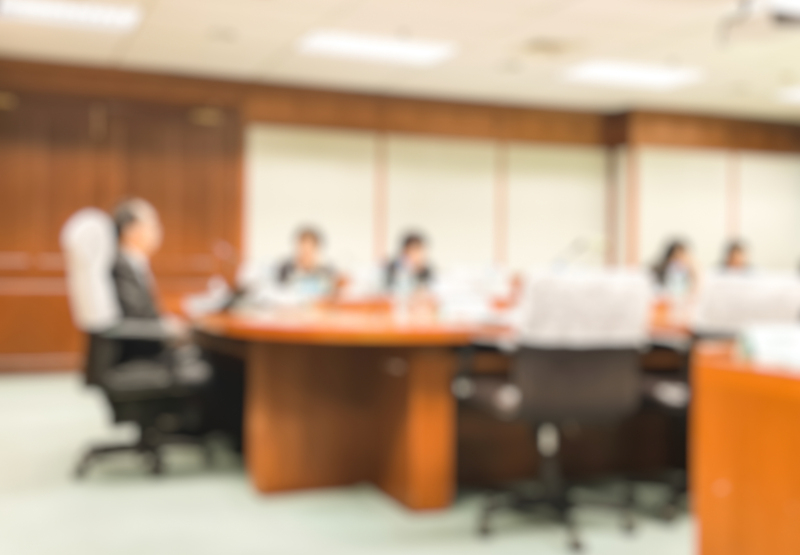 ‍Helps to clarify and align the CEO with the long-term expectations of the board. A CEO unwilling to bet more pay on long-term value creation may not be right for the job. ‍Adds motivation for a CEO approaching retirement to continue to take reasonable risks to grow shareholder value. ‍Increases realizable pay for successful CEOs while ultimately reducing it for unsuccessful CEOs. ‍Mitigates pay for performance issues from increasing target cash compensation for results not reflected in current share price trends. ‍Aligns with policy preferences of shareholders and their advisors for increased emphasis on performance based long-term incentives. Changing to the career pay strategy raises some concerns. Several are addressed below. ‍Wouldn’t career pay increase the risk of a successful CEO leaving a company over pay? Because the CEO career pay strategy supports providing competitive target total compensation, it should not increase retention risks. Notably, there are few recent examples of CEOs voluntarily leaving over pay unless it is for a much larger company that offers a correspondingly larger pay opportunity. If a company has superior performance, then that CEO is already realizing greater compensation than less successful peers. Career pay adds to the realizable pay opportunity of a successful CEO. ‍Why not increase the weight on performance equity through a pay remix and get to the associated benefits sooner than through the career pay strategy? A pay remix is not the same as the career pay strategy nor is it mutually exclusive with it. Following a remix, a company still faces annual reviews and competitive pressures to increase base salary and by extension target bonus. Some companies may want to remix pay and also adopt the career pay strategy going forward. ‍Would adoption of the career pay strategy hamstring compensation committees in setting appropriate pay for CEOs? Companies would be as free as they are today to offer above median cash compensation and pay packages to entice a new CEO to join the company. In addition, boards would remain free as always to exercise their judgment and exceed competitive medians if they feel it is justified and in the best interests of shareholders. ‍Would career pay face strong opposition from CEOs and introduce a contentious issue with the board? Certainly some resistance can be expected as CEOs compare base salary and target cash compensation with peers. Such issues should diminish over time as existing CEOs get used to the “career pay deal” and see its upside in long-term realizable pay and new CEOs join a company knowing that the board follows the career pay strategy. A related issue exists in companies that tie target bonus and long-term incentive grant value to base salary. For example, a Fortune 500 CEO might have a target bonus equal to 150% of base salary and an equity grant value of 750% of base salary. This linkage creates strong motivation for the CEO to push for large increases in base salary because every $1 increase in base salary increases the target total compensation package by $10. The multiplier is even greater if the CEO has a Supplemental Executive Retirement Plan benefit. Career pay greatly diminishes this motivation by capping target cash compensation and unlinking equity grant values from base salary. ‍Would career pay be appropriate for a CEO who is expected to retire soon? 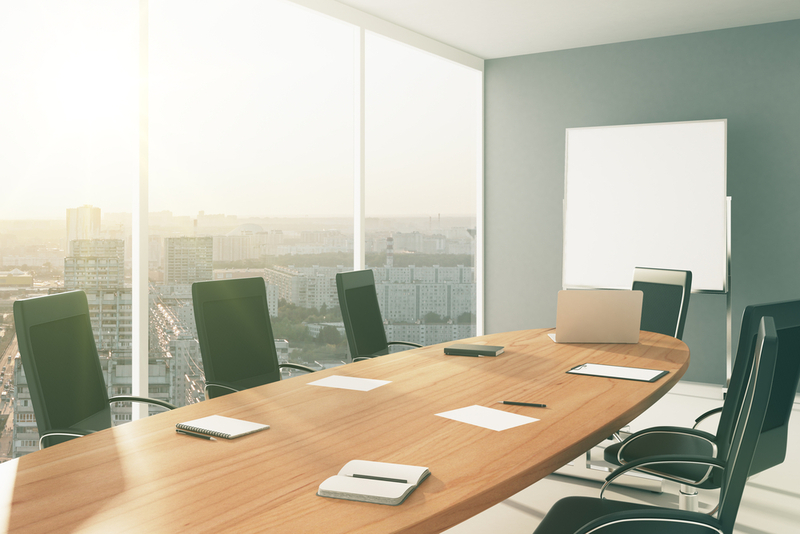 If a board knows that a CEO will be retiring in a few years, it may not make sense to introduce a long-term strategy like career pay. A one-time re-mix of target total compensation may be a better approach in this situation. As always, it is valuable to tailor pay programs to individual as well as company circumstances. ‍Would career pay be appropriate in a company undergoing a transition in its business or one that is subject to industry cycles? Career pay is not appropriate for a company facing a financial restructuring. In other circumstances, a company may not expect to achieve short-term growth in operating results or share price. Yet vesting of performance shares can be tied to achievement of non-financial goals that support the business strategy. Such performance shares provide a reward for successful strategy implementation and flex in value with share price. ‍Would the increased emphasis on performance equity subject more of a CEO’s potential earnings to forfeiture at retirement? ― For performance cycles that are partially completed (perhaps excluding cycles commencing in the past year), paying out awards at the normal completion of the performance cycle and continuing service so the CEO has a full payout opportunity. ― Extending the time permitted to exercise performance options in retirement. ‍Should career pay be extended to other Named Executive Officers and executives? ― The scope of responsibilities for some executives may be greater than is typical for their primary position. These responsibilities are compensable. ― Proxy disclosures show that non-CEO senior executives are more likely to leave for a greater pay opportunity than are CEOs. ― Whereas CEO performance is tied to shareholder returns, performance of senior executives in business units or on strategic initiatives may not be directly reflected in the current share price. ― Most of the heat and light on executive compensation is on CEO pay. 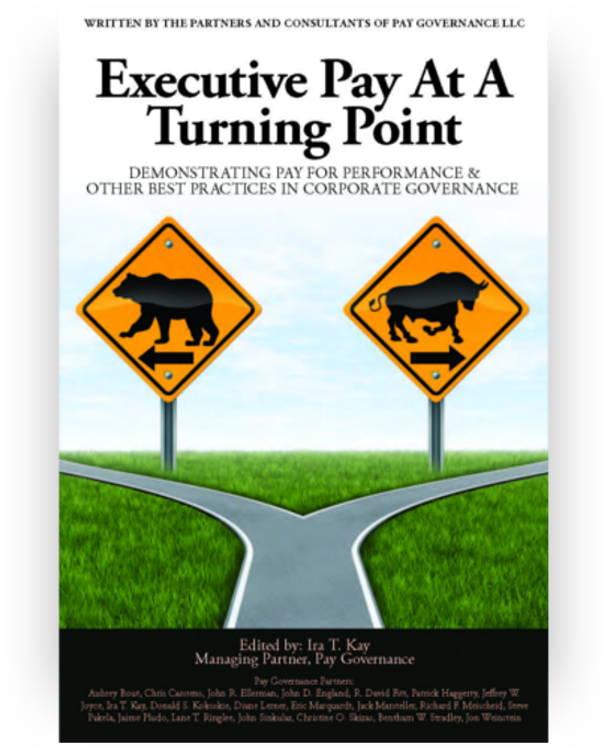 Shareholders are generally more accepting of above-market pay for other executives. Companies and their advisors have been criticized for failing to slow the growth of CEO pay and for not placing sufficient weight on long-term performance-based incentives. While the CEO career pay strategy is not necessarily a good fit for all companies, it offers an alternative for companies interested in slowing the growth of target cash compensation and enhancing the long-term alignment of CEO realizable pay with company performance. Career pay asks the CEO to place a larger bet on his or her business strategy and results over the long term. Isn’t that what boards and shareholders want?